Lower spend per visitor: a 2016 survey by the Bank of Indonesia highlights that the typical Chinese tourist spends around one quarter of that spent by a typical European or Australian tourist. With the proportion of Chinese tourists increasing the economic benefits of each new tourist is reducing. Shorter length of stay: the average length of stay in Bali YTD September 2016 fell to 3.11 days, down from 3.20 days y-o-y. The sub-market suffering the greatest was Denpasar, dropping from 4.53 to 2.73 days YTD September 2016. This is a double-whammy for hotels, with lower yield per tourist and a shorter length of stay. Delayed hotel openings: Owners / investors are delaying the opening of new properties as market performance continues to endure the pressure of new rooms and poor rates. Supply growth in 2015 and 2016 is estimated at around 5%, much lower than the 14% increase recorded in 2014. The pipeline of new hotels remains massive but the delays are allowing the forces of supply and demand to work their magic. 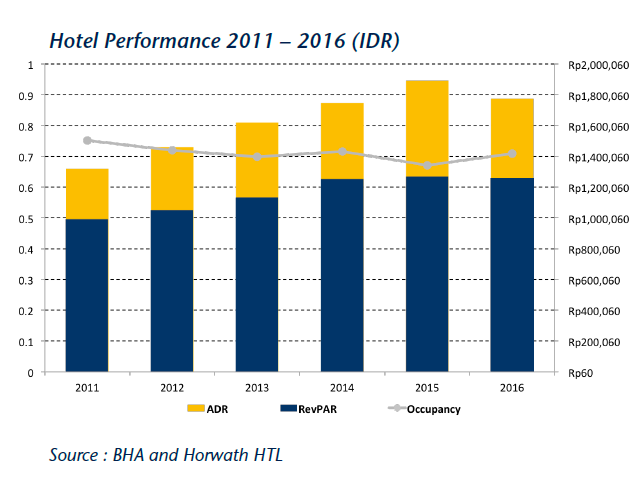 Increased occupancy and decreased ADR: the following sections will highlight performance across categories year-end 2016 but it is very interesting to note that the above demographic shift in arrivals is causing hotels to lower rates to achieve marginal bumps in occupancy BUT in most cases with reduced RevPAR. IDR RevPAR increased from 2011 to 215 before dipping slightly in 2016 (whereas USD RevPAR has decreased over the same period, remaining flat in 2016). Occupancy has been solid all year, as shown in the 4% points increase year-end 2016. ADR in IDR and USD tells a contrary story, increasing 8% and falling 5% respectively. This, of course plays into RevPAR which also shows opposite results, up in IDR and down significantly in USD.